Waltham pocket watches are popular with antique collectors and retailers who specialize in watches. Occasionally, old watches require repair; a Waltham pocket watch may seem difficult to open for mechanical access upon first glance, but knowing the appropriate steps simplifies the job. Turn the watch over to the back side. 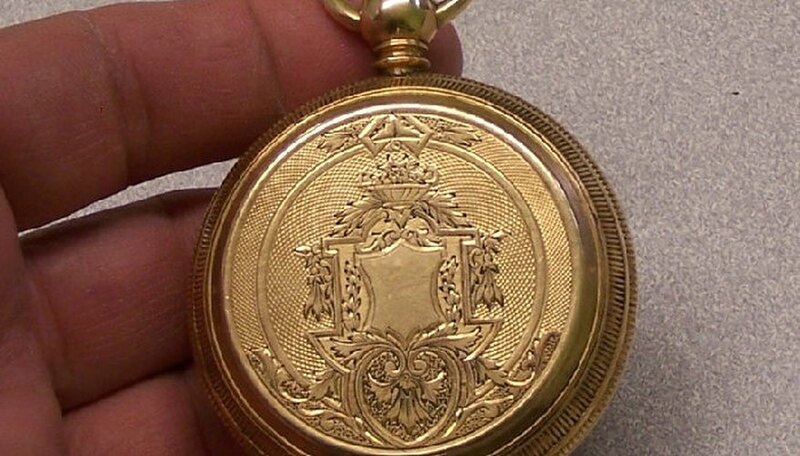 Notice that, unlike many other pocket watches, the back access does not have screws attaching it to the watch body, and it does not screw onto the back of the watch like a cap. Look for the seam in the etched design, which should circle the outer edge of the entire back of the watch. This is the watch's back cover. The back of the watch body has internal threads and the back cover has male threads that screw into the watch body. Place your finger tips together and against the back of the watch. While holding the watch stationary in your opposite hand, keep your finger tips pressed firmly on the back of the watch and turn them counterclockwise. Use alternative methods, such as the palm of your hand or a jar opener, if your finger tips alone won't loosen the back cover for removal. Once loosened, unscrew the cover completely to remove it from the watch body and access the internal gears for adjustments or repair.